Growing up as a kid we spent many a summer at the lake. Rising early in the morning the lake would sparkle, and serve as a mirror with the sun reflecting off of the calm waters. However, it wasn’t long as the hours continued in the day that the waves started to beat against the sides of docked boats and on the water’s edge. It was with excitement we would take our boat out into those waters anticipating what the day may hold. However, I also remember finding myself in the middle of the lake when a storm would blow in and a downpour would engulf us. Experiences such as those were a mixture of both fear and pure delight. As I serve in my current building as an assistant principal I am making some strong connections to my current experiences. Leaders anticipate that the waters won’t always be calm, they have already decided that waves will be inevitable when stepping into the boat. Leaders aren’t afraid to make waves, they understand that there will be storms to face. My friend Bethany Hill (twitter @bethhill2829) would refer to this type of leader as fearless leadership. I’m convinced schools rise and fall, not on test scores, but on leadership – plain and simple. School leadership is not for the faint of heart, and today more than ever waves will result, as we move forward against the steady stream of public perception, testing mandates, teacher turnover, vast socio-economic family dynamics, and outdated best practices that should have retired 30 years ago. Go with the right equipment – It would be foolish to take a boat without paddles, so why go into school leadership without understanding the culture, dynamics, or needs of students. Don’t go alone – Bring others along for the ride. Leadership doesn’t have to be lonely, and in today’s world the call is to connected leadership. Do you empower others to take the oars and row along with you? These people exist on your campus but also through you PLN. Those who are rowing with me include the amazing thought leaders in my Twitter PLN #leadupchat and voxer group. Anticipate the weather – Instructional leadership is a big piece of the pie for a campus building leader, but relational leadership is even more so. Student achievement flourishes when we meet the felt needs of both our students, staff, and community stakeholders. You must understand the weather (campus dynamics) and how it contributes to the waves you are, or may face. 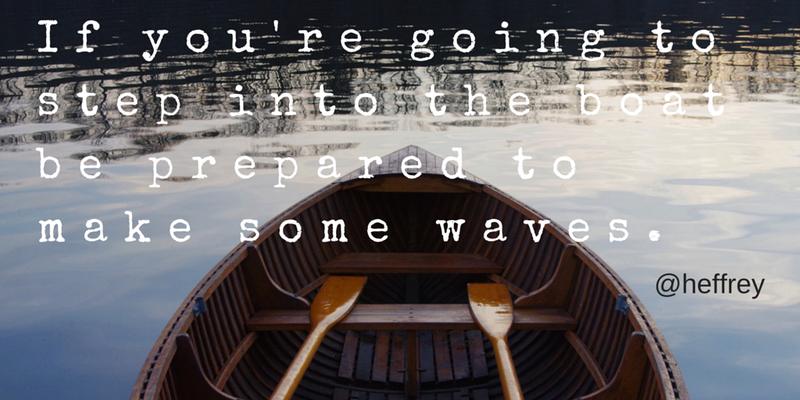 Ride Out the Wave – It isn’t just what happens when the wave hits but how you recover from it. As a leader how you emerge on the other side of challenge speaks tremendously about you. How we navigate rough waters NOW may determine for people if they want you at the helm of the boat LATER. Truth be told it is much safer from the shore, but not nearly as much fun and you miss out on chance to truly experience something incredible as a leader. Our people need us to take risks and to make waves. Today’s kids and tomorrow’s leaders are depending on us to model for them taking chances and having the resilience when knocked about by a few waves. Our people need us to step into the boat often before they will, and if we fear waves, then how will our people ever survive the ride! A pyramid gets smaller as you get closer to the top. Leadership can get lonely if you don’t reach out. I am thankful I have you and Heidi in my PLN to learn and grow from.